A feature-length experimental documentary. Co-created with Derek Murphy, it is a surreal dive into our hometown, Sarasota, FL, exploring the pockets of strangeness that dot an otherwise sleepy suburb. Read more below, or watch now for free here. Sarasota Half in Dream is a collaboration of two young filmmakers - Derek Murphy wrote and directed the film, and I worked as the cinematographer, editor, and producer. While we occasionally received help from friends, especially with sound and score, the 70 minute feature was mostly a two-person job. While Derek had final say as director, we worked together intensely over the 5 years it took to make Sarasota Half in Dream, and made most decisions a joint effort. The film uses everything from drone cameras and archival found-footage to extreme macro lenses and even microscope video to capture a holistic view of Sarasota: large and small, past, present, and future. The film falls into a tradition of experimental documentaries known as "essay films." These films, more expository than narrative, often use voice-over narration to convey thoughts and ideas more so than character or story. Visual elements serve a different purpose, often setting a tone or mood instead of capturing an action or sequence. Essay films like My Winnipeg and Sans Soleil were major references for the film, as well as the work of the early Surrealist André Breton and the novel Invisible Cities by Italo Calvino. Like many coastal Florida towns, Sarasota derives a huge amount of its wealth from tourists and retirees who come upon its idyllic beaches. As such, it is necessary that the city 'sells itself,' creates an advertised image that emphasizes all of its most charming qualities and downplays anything atypical. But growing up there, the experience is obviously quite different. It's darker and stranger than the artificial, idealistic form it presents to the world. As a teenager, the sleepy suburbs feel more stifling than refreshing, and so reprieve is found in the far corners of the city, in overlooked pockets where the sunny facade of the beach and downtown fades into weird, overgrown and forgotten spaces. Sarasota Half in Dream explores a variety of themes and questions. 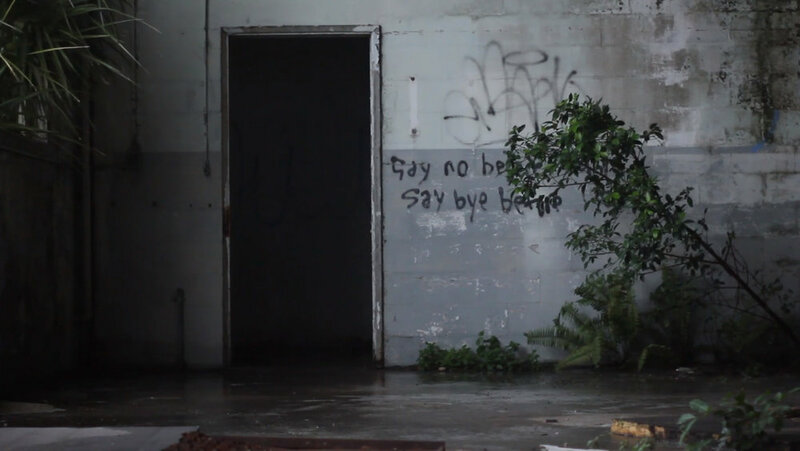 Urban exploration is a large part of the film, using these abandoned spaces to better understand the city that created them. Environmentalist overtones crop up; they cannot be avoided in a city that will be so intimately affected by climate change. The film takes on a youth's perspective, examining the nature of bring young in a city that leaves little space for you or your peers. In its universal themes of urban decay and surreal beauty, the film takes a complicated look at suburban America, its decline and stagnation, and the search for the sublime within its small, ephemeral secrets.